The Model 3-300A was designed in the early 80’s as a space saving alternative to our many thousand fold VE7. 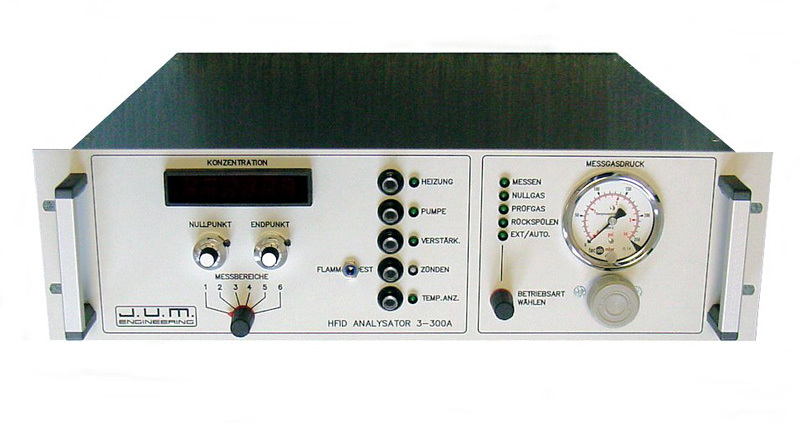 The 3-300A was a also “first” in the industry due to its sample filter back purge feature. It is also a very much liked 19″ rack mount heated FID throughout the stack testing community and well known for its ruggedness, forgiveness and long standing accuracy and sensitivity. The 3-300A is fully identical to the VE7 and 3-200 and has been officially approved for that. TÜV confirmed to fully comply with QAL 1 (EN 14 181 and EN ISO 14956) and EN12619 regulations. They also fully complies with USEPA Method 25A and Method 503.
is a 100% identical version at 20% lower cost due to the use of a disposable sample filter in the heated oven. With this exception the 3-300/OVE is a 100% identical analyzer.